PHI 328. Syllabus. Welcome to the Course! ⊕ PHI 328 (History of Ancient Philosophy) satisfies a requirement for the Philosophy BA and satisfies the H (historical awareness) and HU (humanities, arts and design) core areas of the General Studies Requirement. The dates that mark the beginning and end of ancient Greek philosophy are conventional. In 585 BCE, a solar eclipse occurred that Thales predicted. In 529 CE, to protect the Empire from corruption, the Christian Emperor Justinian prohibited pagans from teaching on all subjects. 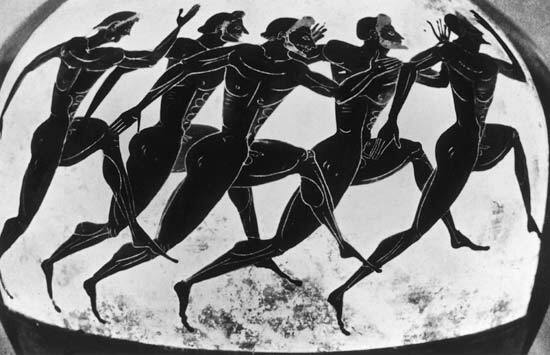 The Panathenaic amphorae were prizes in the Panathenaic Games. They contained oil and were given to the victors. The oil was from the sacred grove of olive trees in the Academy (Ἀκαδήμεια) (a place Socrates would later frequent and Plato would later found a school. The Academy (located near the river Cephissus about a mile northwest of Athens) took its name from Academus (Ἀκάδημος). In the siege of Athens (87-86 BCE), the Roman general Sulla "laid hands upon the sacred groves, and ravaged the Academy, which was the most wooded of the city's suburbs, as well as the Lyceum" (Plutarch, Sulla 12). "[Cimon] was the first to beautify the city [of Athens] with the so-called liberal (ἐλευθερίοις) and elegant resorts which were so excessively popular a little later, by planting the market-place with plane trees, and by converting the Academy from a waterless and arid spot into a well watered grove, which he provided with clear running-tracks and shady walks" (Plutarch, Cimon 13.8). The adjective ἐλευθέριος translates into Latin as liberalis. Cimon (6th to 5th century BCE) was an Athenian statesman and general. He was involved in the rebuilding of Athens after the Persians destroyed it in the war in 480 BCE. Plutarch, Platonist, 1st to 2nd century CE. Pausanias, traveller and geographer, 2nd century CE. ἀμφορεύς (shortened form of ἀμφιφορεύς = ἀμφί ("on both sides") + φορεύς ("bearer, carrier")), amphoreus, noun, "two-handled jar with a narrow neck." Ancient Greek philosophy begins in 585 BCE with Thales of Miletus. It ends about a thousand years later in 529 CE. Within this nearly thousand year tradition, historians recognize three main periods: the Presocratic Period, the Period of Schools, and the Period of Scholarship. The focus in this course is on the first two periods, or roughly the first 500 years of ancient Greek philosophy. Within this focus, the concentration is on Socrates, Plato, Aristotle, and the Hellenistic Philosophers (the Epicureans, the Stoics, and the Academics). This focus is standard in the sequence of history courses required for the philosophy major in most American universities. The approach in this course is historical. Philosophy is not an inquiry into the past. It is an attempt to solve philosophical problems. The history of philosophy does not have this aim. Its aim is to understand what the philosophers thought about certain matters, why they had these thoughts, and how these thoughts figure in the history of philosophy and other histories. This course meets online and is conducted through the Learning Management System Arizona State University uses for its online programs, but most of the materials (the lecture notes and most of the ancient texts) that comprise this course are available to everyone on the internet. ⊕ The letter grade (A+, A, A-, B+, B, B-, C+, C, D, E) for the course is determined by your grade on 5 quizzes (50%), 10 questions (40%), and 5 debriefing sessions (10%). There is a quiz for each of the five units of the course (Presocratics, Socrates, Plato, Aristotle, Hellenistic Philosophers). Each quiz consists of ten multiple-choice questions. There is a set of questions for each of the five units of the course. Answers to each question should be about one to two pages in length. The grade for each answer is pass/fail. There is a "debriefing" session for each of the units of the course. In the debriefing sessions, you are to share your thoughts about the reading in the unit with the class. The 5 quizzes (10 points each), 10 questions (4 points each), and 5 debriefing sessions (2 points each) sum to determine the letter grade for the course: A+ (100-97), A (96-94), A- (93-90), B+ (89-87), B (86-84), B- (83-80), C+ (79-77), C (76-70), D (69-60), E (59-0). There is no extra credit, but I am happy to help students with independent projects. Late work will not be accepted without good reason. Incompletes are given only to accommodate serious illnesses and family emergencies, which must be adequately documented. The aim of this course is to provide the student with an understanding of the most important developments in ancient philosophy in the period from 585 BCE to about 100 BCE. These developments in the history of philosophy are interesting for what they show about the human experience in one part of the ancient world and for the insight they provide into ourselves. Many of the assumptions that inform contemporary ways of thinking have their origin in the thought of the ancient philosophers. Understanding the circumstances in which these assumptions became part of the philosophical tradition allows us to consider whether they remain useful for understanding ourselves and our place in the world or instead have become a burden and should be rejected because they are vestiges of a way of thinking that we no longer accept. The textbook is Ancient Greek Philosophy: From the Presocratics to the Hellenistic Philosophers. The readings are selected passages from the ancient texts for the period of study. This material is the primary evidence on which our knowledge of ancient philosophy depends. For the most part, these texts are freely available in the Perseus Digital Library and elsewhere on the internet. You may wish to consider certain supplementary texts that contain more modern translations and information about the secondary literature. These texts are not required for the course. ⊕ These notes change from time to time in my effort to improve them. To get the latest version, force-refresh (clear the cache and reload) the page in your browser. ⟳ There is a set of lecture notes for the readings. These notes are to be read in conjunction with the textbook and the selected passages from the source material for the period. Links to this source material (in the Perseus Digital Library and elsewhere) are included in the lecture notes. I welcome suggestions (via email) for additional notes and links, as well as for changes to existing ones to clarify them, correct outright mistakes in the interpretations, fix broken links, or correct other problems, such as typos (which I know exist but are difficult for me to see).